Gives me another reason to stay in bed (not that I need any in the first place). Love this pic! 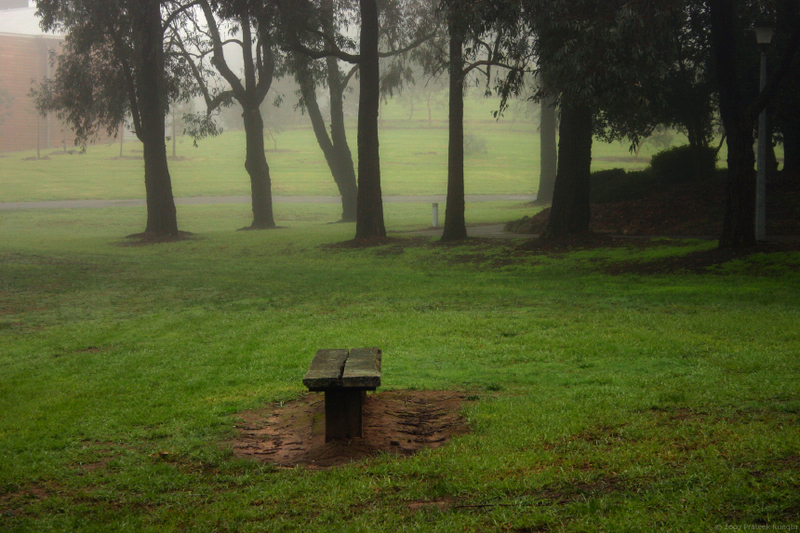 Well i'm biased towards the fog... but my favourite part is the lonely bench to centre it all. Exams is a good enough reason to stay in bed... But for your sake hopefully you're studying in bed :P Atleast the cold is much more agreeable for a studying weather than the heat(that i'm experiencing). Good luck again! Do well! BEST OF LUCK FOR YOUR EXAMS RUNGTA! I believe that there are atleast 3 things that dont require any reason or justification: sleeping is one of them. The other two would be FOOD - big time and to attend the nature's call. Oh man! I just wish it was frikkin cold here ;) ! With this muggy sultry Delhi heat; cold sounds and looks like heaven! okay.. i'm going a bit freaky. But it is a great pic. And dude! these qs for verification.. well.. its asking me if I'm human and I really feel like answering NO! You know me a bit too well Rashmi! Tarun : I do, as you said, prefer winters over summers but that's not to say that 1℃ is very pleasant. Glad to have given you a winter feel though. Siavash : Finally someone else who's feeling the cold just as well :). All the best for your remaining exams as well Siavash. The other two would be FOOD - big time and to attend the nature's call. Sumedh : I remember the Delhi heat a bit too well. Here's hoping you're blessed with some showers soon. Anchal : Ah...I was waiting for someone to draw a spooky analogy to this one :). Thats no forest. Infact, the building slightly visible on the top left corner has been featured on this blog earlier. its asking me if I'm human and I really feel like answering NO! Reminds me of the mellowness I feel when fog sets. Well composed shot. Thanks Rakesh. Congrats on getting your site started :). Ka baat hai rungta bhaiya...bahut kamaal ka photu kheeche hain aap. It can easily pass as the cover of a book. Doesn't it give a Hogwartsy kind of look? Wow. Just wish it were like that here..It's so sultry with all the humidity here. Monsoons are the worst part of the year in Delhi..the place cools down for a while but the humidity starts killing you. You should consider changing the name of the LinkedList plugin. Because when you search "Linked List" on google you get a whole lot of other results. And you should put enough meta tags for it to get noticed. Varenya : Hogwartsy look? Not to me at least. Then again that's probably because I see this place almost every other day. Abhishek : Yeah the humidity is just as bad. As for the LinkedList name, I know its not the best but I haven't been able to come up with any other good ones yet. Oh and most of the meta tags are blankly ignored by the better search engines (including Google). They do however use the description meta tag for generic searches. I seem to have forgotten to add that to my LinkedList page though. i would say the best till now. dnt we all love winter. good luck wid exams dude. how do i get the hi-res again? WINTER - strikes alot...cardigans, socks, gloves, hoots, shivers.....heater! But yet we all love it alot... :P Oooo how i wish i was there! Hey..rungta how did ya examz go??? Good to see you back here Bavani. Exams weren't too bad. Just one more to get through on Monday.